Liberty Shoes Ltd., the only Indian company which is amongst the top 5 manufacturers of leather footwear in the world, was recognized with “Franchisor of the Year Award 2013 in the Footwear Category”. industry platform that recognizes excellence in the development of the franchise industry in India. The awards identify the initiatives and success of entrepreneurs and companies that have contributed to the development of the franchise and retail sector in India. Expanding in the untapped market, new product line up, investment in technology and product innovation has helped reach Liberty where it is today. A Liberty franchisee strives for a better ROI, (more than 30%) and always wishes to expand. Four years prior to undertaking a new distribution and replenishment solution, Liberty’s sales and profits were negligible which made the company implement the ‘Theory of constraints (TOC)’ which helped in increasing the sales and more importantly, profitability. With the implementation of TOC the distributors and retailers have much greater return on investment, triple inventory turns, and can expand rapidly with fewer risks. Franchisor of the Year Award 2013 is in a way the recognition for such initiatives which has helped the franchisor grown at a rapid pace. Liberty has added 50 additional stores to its network in the first 6 months of this financial year and aims to add another 50 stores by March ’14. The trust and faith people have shown in the home grown multinational brand is commendable. Each year this time the celebration and acknowledgement of the franchisor-franchisee relationship comes with Franchise Awards, India's topmost honor in Franchising. Liberty Shoes Ltd. has been recognized as a company with outstanding franchise model, specifically in the field of operations and strategies. The Franchise India Awards put standards, ethics and best practices at the top of their agenda through positive recognition of those that lead the way. Dedicating this recognition as an effort of the entire team and sharing overwhelming love for his franchisors, Mr. Anupam Bansal, Executive Director, Liberty Shoes Pvt. Ltd said, “It is an honor for Liberty to be recognized as the Franchisor of the Year 2013; I take this opportunity to thank the eminent jury for recognizing our efforts. These awards, over the years have become the epitome of achievement in the retail segment. To become an ideal franchisee takes a lot of effort and time and Mr. Manoj Singh has proved it for us. It is a win-win situation for both Liberty and its franchise team and this award is surely a priced possession for every team member.” Mr. Bansal further elaborated on the fact that, “This is a result of constant brainstorming of ideas and rapid expansion plans which gives the best ROI”. Liberty has always received tremendous response from the franchising model, which it follows since so many years. Out of 400 stores in 120 cities and towns, 325 are Liberty’s franchise stores. Franchisors want franchisees to succeed. That's why intensive training is part of Liberty’s franchise model. Liberty’s success stems from an innovative marketing approach. 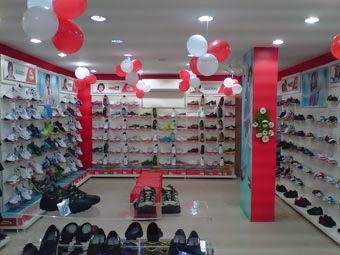 It is an approach that goes against the general perception of what works in the market by opening and running franchisee showrooms on cash and carry format without ensuring minimum guarantee. Liberty has been helping the franchisees to plug the need and supply gaps by focusing on new products that match emerging footwear trends and deliver the hottest styles matching the consumer needs.